I love walking through Ballard Designs and savoring all the beautiful design inspiration in their showroom. The collection of small boxwood topiaries are one of my favorites, but I could never justify well over $50 each. I decided to see what I could create with my own DIY version. 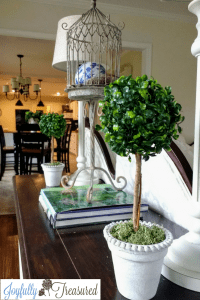 This faux boxwood topiary is so simple and fun to put together. I hope you enjoy it as well! Post may contain affiliate links. 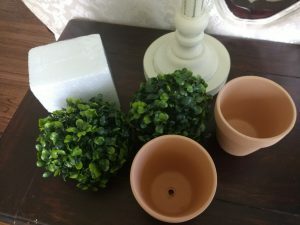 I started with a few four inch terracotta pots that I spray painted with multi-colored texture spray paint in carribean sand. After the first coat, I had an idea! I hot glued mini pom pom trim around the rim of the pots. Next, spraypaint right over the trim and about an inch inside the rim to give the pots a more ornate look of a scalloped rim. The trim edge became very hard and durable once the paint dried. Cut floral foam into a rectangular shape to fit inside the pot, leaving room to cover moss over top. I used sticks and twigs from my yard for the stems. 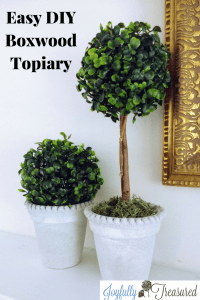 You might take a walk in the park or your own backyard to find the perfect stems for your topiaries! Hot glue the topiary stem into the center of the foam rectangle. Then, secure the sticks and twig to the faux boxwood topiary balls with hot glue. The last step is to glue some floral moss in the pot to cover the foam. 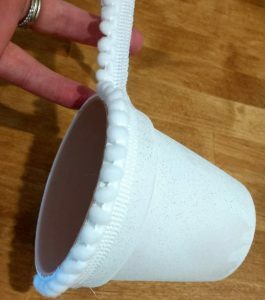 I made one without a stem as well and just placed the ball straight into the pot! 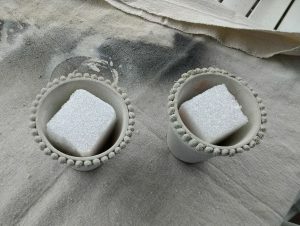 The idea of gluing the pompom trim on the rim nicely embellished the low cost terracotta pots, and I was pleasantly surprised how hard it dried! 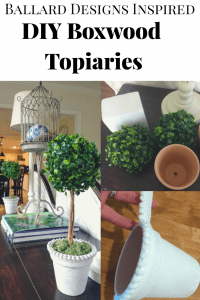 It’s so easy to customize each faux boxwood topiary to fit the space you are decorating. I love everything about these and I know I will be making more soon! These are really cute, Thanks for sharing on To Grandma’s House We Go! Welcome, Get updates to your inbox!